Yes, we did it again! After weeks and weeks without doing anything except working this is the second weekend in a raw when we did something to restore our spirits and refresh our souls. We had fun! Today in Manchester (Manchester, UK, this is) we had glorious weather – sunny, the light still gentle and the sun warm without the relentless strength of the South. In brief, one of the days when I look around and think that living in Manchester is so much worth it. And since it was a real pity and a waste to spend such a day indoors we went to Dunham Massey Park – a large park part of the National Trust (for my American friends this is an organisation that owns and looks after stately homes and the surrounding parks and keeps them open to ‘the masses’; funding comes mainly from annual subscription and we are members which means that we can visit and park for free). The picture was taken there today. We walked, and talked and had great time. I was looking around and for the first time in weeks I noticed the beauty around me; all fifty shades of green that merged into each other and formed the patchwork of nature. The only dull thing was the grey of the man-made path through it. Today was magical; it was made of moments like the one on this picture. 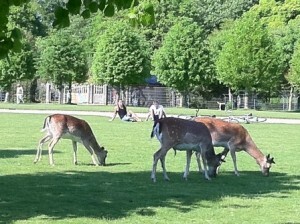 Look at the deer grazing around the visitors. 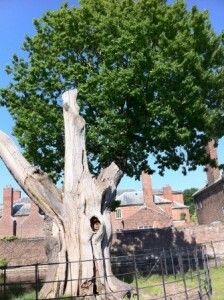 And the tree on the next picture was fully grown during the reign of Henry VIII. I received a message that the very complex piece of writing I was telling you about is very much liked by the people it was written for. Have an article published in Science which makes me feel so honoured – not many sociologists get to publish there; in fact I started getting messages about how to organise and upgrade my lab J. And, apart from being included in five carnivals, The Money Principle was mentioned in two round ups: by Totally Money and The Millionaire Nurse Blog. Thanks! Looks like a beautiful weekend. We had nothing but clouds and rain here which sucked. I really missed the sun and so did my garden. Hopefully the sun returns this week. PS: Congrats on the publication too. That is AWESOME. @Miss T: Such lovely weather is very rare here; Manchester is the wettest place in the UK and this is why it grew as a city – working cotton needs humidity and water. This is what make is so special. But when the weather is bright the light is perfect! Thanks! I do feel honored to have published in Science. It was like a writing bootcamp – they have wonderful editors. @Daisy: Sorry to hear about the subburn and hope it is better. 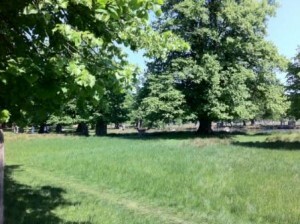 Here it is still sunny and warm – in fact too hot to run any enjoyable distance. But soon things to be back to normal – and what is left is our memories. The Greeks have a wonderful word for this – esterophemia; but than they will do, won’t they. The word means memories but includes the memory of feeling – a young man gave it as a present to me a long time ago. I’m glad you made the most of a lovely weekend. Enjoy it while its there! @Pat: And it is still here! Wonderful in every way except it is too hot to run and I have to if I wish to celebrate this brthday of mine in style. Cool stuff. When will your article be published? Send me the link or write about it if you can. Looks beautiful in the park. We’ve visited London and environs once, and there’s so much that’s so old it’s amazing. My wife had to find the Roman wall. It’s not much to look at until you think about how long it’s been there. @Dr Dean: The article was published last Friday (Science have a very strict embargo policy which almost killed me; when something like this happens you want to shout it from the rooftops – blogs and twitter is the modern equivalent, I suppose – and you are not allowed to.I’ll e-mail it to you later. And yes, we are very pround of our ‘old stuff’ here. It runs deeper than Roman ruins and in the UK it is even more pronounced than elsewhere in Europe. When I first moved to the UK, I couldn’t believe that people will proudly tell me they are wearing something they bought years ago – now I comprehend.